• Current Carry: Martac AA, w/ 10' of bankline wrapped around to fill the overly-deep groove about halfway down. • Multi-Tool: Something simple and capable, taking into account your location and security. • ***Keys: On a weight-bearing climbing carabineer; keep only the ones you need; minimize jangling noise by clipping onto the inside of front pocket and dangling keys inside; carabineer can also be used to clip things like flashlight or multi-tool lanyards to where you don't want them "walking" away. Unfortunately, I am unable to carry a sidearm to work, but that does get added in w/ an IWB holster too. Love the handkerchief idea. I added it to the "official" level 0.5 list and specified silk for best thermal properties. I'm really liking how yall developed the 'Equipage section'. Very well thought out. 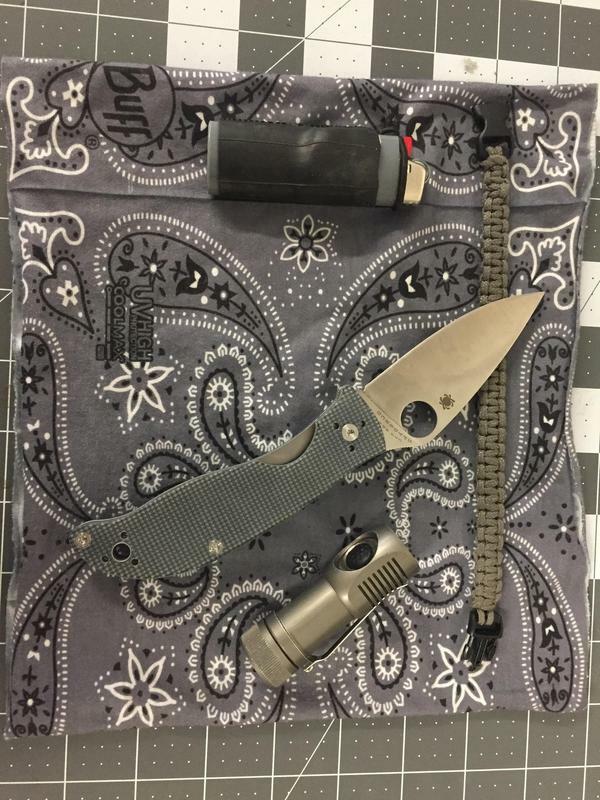 - I've been evaluating a Rogue Gunfighter no-vis ankle med kit (need baggy cargo pants), as well as an ITS tactical EDC trauma kit (fits in a cargo pocket). I have a small set of tweezers on my key ring along with a BSA fire spark also. Carry a Streamlight micro stream in my art front pocket along with a Alox Bushcrafter. Keys in left front pocket. In coat pocket have a full size ferro rod, AMK emergency poncho , a thin balaclava , a ESEE Candiru , 550 cord 10 ft. A Bic lighter, rite in the rain notebook' fisher space pen , 2gallon ziplock bags and 2 qt ones also. Belt a Leatherman Wave but am going to get a Surge instead. Small PSK in a glove case. Navy wool watch cap on my head. Combine with seasonally appropriate clothing. Usually boots, pants and a light jacket. I too have been debating an ankle med kit, but I'm usually near a vehicle in the front country and I have a more extensive kit in there. Plus, it already takes me longer to get dressed than my wife with what she has dubbed my "batman utility belt." FWIW - I've had great reliability out of my 10 round 1911 mags, and check pretty regularly. That being said, 10rd mags are known for being less reliable. So I put the tolerance stack in my favor and only run ball ammo in my 10 round mag. That's the nice thing about .45 acp over 9mm - you don't have to run premium ammo to get good results. I carry a 10 round mag in front and an 8 round mag with premium ammo behind. Prints less than double 10 rounders. Sound advice. I haven't personally experienced any problems, but give the propensity of the 1911 to get finicky with mags I can see where that could be an issue. I will admit that I cycle my carry ammo about every three months and that's really the only time I shoot it. So far so good. I've only recently started using the 1911 for daily carry, but it's been a beside gun for a few years. One of the 10 rounders I carry is ball. I like to make the excuse that it's for the event that I need hard barrier penetration, but really it's because there's only 20 rounds of carry ammo in a box, haha. I dress professionally, but I do regular wear my Leatherman, which does not excite anyone at work. 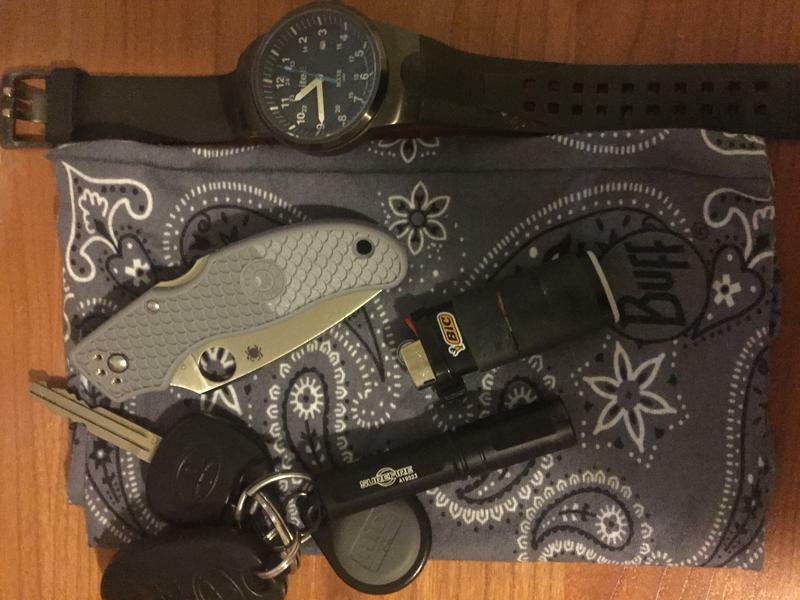 My pockets include a bandanna, amall pen knife, chapstick, a flashlight with a small lanyard and mini carabineer. I usually use grey or black bandanna, but on reflection, i'll switch to a red one and start carrying a lighter as well. There are a few items I can't carry into work because of company policy. Those items are in my vehicle, along with a lock box and my get home bag. My vehicle is parked in an adjacent surface lot which off company property. I also carry some items in my lunch bag to augment what I can carry in my pockets. I am currently a type 2 diabetic, so I carry additional medical items. My EDC includes three days of medication and a blood sugar testing kit. I have a small medical kit for minor hurts and foot issues. Also present is paper map of the area, a small cell charger and an external battery for charging my Razr Maxx. I do have a full IFAK that I can add if the tactical situation changes. I have completed my CCW training and will be applying for my CCW. Once granted, I 'll be carrying my S & W 9 MM Shield with extended mags. I have already fitted out my HPG Heavy Recon Kit with magazine pouches for backcountry trips. Weekends, I also carry an assisted opening folder. My vehicle long gun is a Mossberg 500 with the Adaptive Tactical mod and a saddle ammo carrier. I currently have the five round mags. I've been holding back getting the ten round ones because they are pricey and they really can't be serviced in the field. I would like to get one of the new Kel-tec folding carbines as a vehicle and get-home long gun. Just saw the LED lenser p2 flashlight. it is .2 0z heavier than the microstream, and not as bright but does have an on off tail cap and focus bezel about 6.5 hours runtime. The P3 gets you 75 lum for .1 oz more and about the same size but you go down to 1 hr run time. I like the micro stream but thought I would throw some other options I found out to the readers. I have also carried a photon 2 led keychain light for over 15 years. I chipped the LED the other day (still works), but the company said they will replace it for free. It has been worth it's weight in gold, Small enough I always have it, and there when I need it. 15 years ago I bought a photon 2 led key chain light. It has been in my pocket ever since. over the years the LED chipped, and the plastic on the button cracked a little, but it always worked and was very handy. Possibly a lifesaver at times. So I was going to buy another the other day to put with another kit. I saw their "lifetime" warranty and thought I would give it a try. Long story short the replaced it, and had excellent service. They make many models styles. I have had a Photon on my key chain for a very long time, not quite as long as nomad77, but many years. Have several stashed in survival kits as well. The kids have them on the lanyard ring of their SAK Farmers. Not my main light, but there's always one with some part of my gear. Recently (last year anyway) I went to a Fenix LD09 for daily carry. Had the same thing in the AAA version (LD02.) Really liked the smaller one, but lost it hunting - not the ideal pants or situation for pocket carry. Went to the AA because it matches my headlamp and GPS (the two things I carry batteries for in the hills. Haven't had an issue with the dual power clickie for two reasons. The first is I have just gotten in the habit of making sure I cycle it through the low power after using it. The second is that even the low power is pretty bright. Probably going to get another LD02 for EDC and put the LD09 in the Kit Bag at all times. Not knocking other choices in small flashlights, but have been very happy with Fenix's stuff. I was curious as to what the 1/2 buff is, is it a bandana or neck covering? Spyderco UKPK or Squeak - I'm in the UK so it's slipjoints only. Mini prybar - as I have no fingernails to speak of. Also saves my knife when opening boxes. Olight S1A Baton - 600 lumens from a 14500 and can use any AA battery. G-Shock GW 7900 - solar powered and atomic timekeeping. Moleskine notebook and Zebra pen. Keys, phone and wallet go in my Tara.